Artists: Haisla Collins, Sharifah Marsden, Richard Shorty, Eric Parnell. Word Art by Nicola Campbell. Best Viewed: In alley East of Gore or in the parking lot at the Patricia Hotel across the street. Through the Eye of the Raven The Raven Dancer, dressed in a traditional button robe, holds the ‘Looking Forward, Looking Back’ symbol, signifying the importance of the past when viewing the present, and looking to the future. In ‘Through the Eye of the Raven,’ the light of day is cast upon what, for many on Vancouver’s Eastside, is a dark and forbidding place. Yet the Raven sees past the troubles of this time, alighting upon the sacred canoe of the Coast Salish and reminding us of the rich and powerful heritage that is the birthright of Aboriginal people. 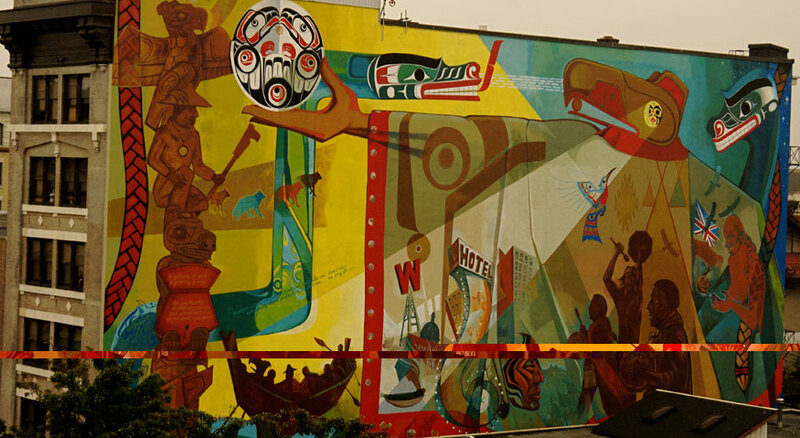 Salish serpents and patterned braids frame the mural, while animals walk along the hem of Raven’s blanket. This button blanket enfolds both the terror of the residential school system, as well as the strength and courage of those who stand up and speak for justice. Finally, the hummingbird, a Tutchone symbol of hope, flies above the Vancouver cityscape towards the light.